Tired of just hearing about exciting conferences about the future? Do you want to know what it’s like to see some of the smartest people on the planet talk about the Singularity? Well, now you can. The Singularity Summit is an annual gathering of leaders in research, industry, and philosophy that give presentations and lead discussion in how the future may unfold. Singularity Summit 09 was held the first week in October in New York and videos are now available online. Click on these words or the screen capture image below to go directly to Michael Anissimov’s* Vimeo channel and start watching the videos. 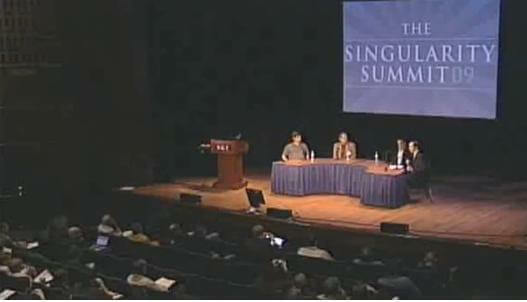 Click this screen capture to take you to the Singularity Summit videos. While the set of videos is not yet complete (there are still a few waiting for permission from presenters), there are two dozen to keep you busy. That’s nearly six hours of the summit to get your neurons firing in consideration for the future. I can’t say that I have any favorites yet, but I would definitely watch the panel discussions. Where else can you see so many leaders in their field sit down and have a reasonable discussion about immortality or killer robots? Wait a second…why are you still reading this? Go watch the videos already! *Anissimov is the media director for Singularity Summit and the Singularity Institute for Artificial Intelligence (which hosts the summit each year). Along with Ray Kurzweil and Michael Vassar, he heads the organization.